Browse through my complete list of paintings or click a letter to jump to a list of titles starting with that letter. Click on the title or image to see more information, or click on an available product to see purchase options. Windmills have always been a favorite subject for me. They were a lifeline for the early settlers and with the invention of the electric pump, seemed destined to becoming an obsolete part of our vanishing rural scene. Now, due to our energy problems, many of the old Windmill companies have resumed production and we will have these graceful machines to enjoy for many more years. 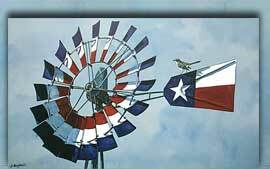 This fine Windmill is on the Anchor X Ranch, the scene for two of my previous Lithographs! Wild Turkeys are very abundant in Central Texas but if you go looking for them you will probably be disappointed. However if you are only looking for "a nice tree" to paint you might just stumble on to a flock of Wild Turkeys. Observe quickly because they won't say put for long! I had a contest in my spring newsletter to name this painting, not knowing that I would have to decide from over 500 suggestions. 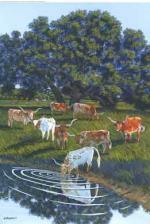 This title became appropriate because of the Longhorn having to decide whether to stay in the pasture or navigate the rocks to water and my having to choose a name for this print! (Written in 1977) The early morning light frequently illuminated these two trees that stood beside the street on the way to my Daughter's school and many times reminded me of driving along the Colorado River watching the waterfowl rise up from the morning mist. The Live Oak Decline, a fatal tree disease, claimed these two fine oaks this year.